For many Africans, access to justice remains out of reach. 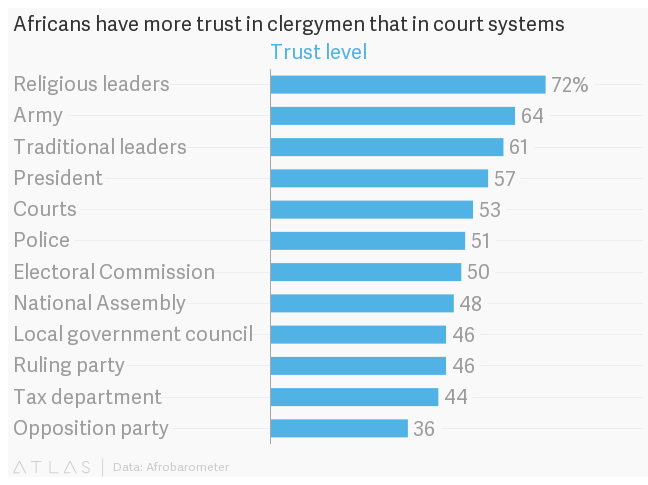 While just over half of people on the continent have faith in the integrity of judges and their local courts, Africans are more trusting of religious and traditional leaders, says a survey from Afrobarometer, which collects samples from respondents across 36 African countries. Respondents reported similar problems with their judicial systems across the continent, including delays in handling or resolving court cases. In Nigeria, where only 38% of respondents trust courts, severe delays in court processes have resulted in the current reality where up to three-quarters of the country’s entire prison population are serving time without a sentence. Other common problems are a lack of legal advice as well as high court fees, according to the survey. For low-income earners, these high fees particularly pose a major impediment to justice. Perhaps more damning for judges, 33% of respondents in the survey think judges are involved in corruption. On a country by country basis, the perception of judges’ involvement in corruption is more nuanced. While over half of respondents in Mali, Liberia, and Cameroon say “most” or “all” judges in the country are corrupt, less than one-fifth of respondents in Tunisia, Lesotho, Botswana, Mauritius and Cape Verde share similar sentiments.